Dan Balmer, marketing and event manger Asia Pacific of Rolls-Royce Motor Cars, stands next to the new Ghost Extended Wheelbase during its launch in Mumbai, India, Wednesday. AP. 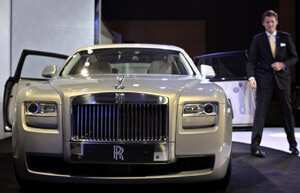 Mumbai: Ultra-luxury car-maker Rolls-Royce Motor Cars on Wednesday launched a new variant of its Ghost model at a starting price of ₹ 3.05 crore to tap the growing luxury car market in the country. The Ghost Extended Wheelbase is powered by a 6.6 litre petrol engine and will be available in the market soon, the British company said here. The company expects every third car it sells in the country to be the new Ghost Extended Wheelbase, he said but did not put a number to it. “I can’t say the exact numbers, but we are very optimistic for this year. We are working on how we can expand this market," Hasenoehrl said. The company sold around 80 units in the country in 2010. It also plans to expand its network in the country. “India is one of the major markets for us in Asia. Therefore, we are looking at enhancing our distribution," Hasenoehrl said. At present, it has just two dealerships - one each in Delhi and Mumbai. “I cannot say how many dealerships we are going to add, but we will increase our dealership network soon," Hasenoehrl said. The company sells the Phantom and the Ghost in the country.